and I couldn’t stop laughing. It seems to me that if the airline was really that concerned about fuel burn, it could probably do without the onboard showers for First Class passengers. The plane has 489 seats, and this moves apparently saves 4.4 pounds (2 kilograms) per seat. So that means they’ll save about 2,100 pounds per plane. In case you were wondering, the plane weighs just over 1.2 million pounds at its max takeoff weight, so this isn’t much. But that being said, it will save something, and every little bit counts. Now, I understand that they’re planning on offering all that paper content on the video screen instead, so it does make sense, but I still can’t get past the whole shower thing. In case you missed it, Emirates will be offering showers for First Class passengers. It is said that the airline will have to bring 1 tonne of water for this purpose, and guess what? One tonne is 2,200 pounds. That’s effectively the weight of all those paper products that are being removed. So, if you’ve crammed yourself into coach and your seatback video doesn’t work, you can take comfort in the fact that at least First Class passengers can shower onboard. Or not. I have to agree that this is really funny. It makes no sense at all other than that Emirates is more focused on the first class passengers. Showers are a good thing. Amazing how many people who geton airplanes really stink –either form too little hygene or too much perfume. Pre-flight showers should be mandatory for all passengers…then when we pass through security the TSA goons will be delighted we are all wearing nothing but our towels (which will probably be mandated in size by some ultra top secret security mandate). The papers stay for the whole duration of the flight unlike fuel which is burnt or dirty water that I assume could be let to evaporate. 2kg (4.4 lb)/seat in paper sounds too heavy though, did somebody overestimate? JetSetter – Yep, they’re definitely focusing on the First Class passenger, and there’s nothing wrong with that. But make them shower on the ground when they arrive. Toting around all that water is a waste. Andy – I’m not so sure that dirty water does exit the aircraft. Anyone know for sure how that’s handled? Either way, it probably doesn’t matter. The reality is that most people are going to shower when it gets close to landing so that they’re fresh when they arrive. You’ll still be carrying all that water for most of the flight before it’s used. That 2kg number appears to have come from Emirates. Not sure how accurate it is, but I don’t see why they’d lie about it. Although, that would probably fix the capacity problems. I would rather drive than have to be around those people in all draped in nothing but towels. You can’t release soiled water from an airplane. That’s how people end up with blue ice death. Exactly what paper is being removed? The in-flight magazine? Doesn’t cover its own costs in addition to promoting Emirates and Dubai? A good inflight magazine — and Emirates’ Open Skies is pretty good — is a valuable marketing tool. Frank, it sounds like swim class in high school, and that means they can turn off the hot water. However, a shower basin presents more problems with greater volume. If it has a waste tank to hold the water, then would that pose an eventual health risk, not to mention the slime buildup of soap and shampoo? Also as one who has showered on trains, the water temperature/pressure can vary greatly. What’s gonna happen the first time that big boy hits some CAT and a shower flies into the shower head? Maybe Frank does have a good idea. I meant a showerer flies into the shower head. DRG – Yes, the inflight magazine and the duty free stuff as well. Those things can be the size of books, I think, but I’ve never flown Emirates. To be clear, they’re keeping the content, but it’s just going to be digital. The entire magazine will be accessed via the IFE. Brian–that showerer gets no sympathy from me! SHOWERS ON A PLANE???! What’s next? Bidets?!!!! In-flight laundry service?! Puh-lease!!!! Too many dollars, too little sense. Sue – Um, yeah. Bidets are already on their way . . .
Reading an inflight magazine on a video screen? I won’t be doing that. Reading on a screen is uncomfortable. Not sure the duty free magazine would get as much of my attention either, unless I was specifically looking for something. Only 1 ton of water? Mrs. Coward goes through that much in one regular shower, let alone a weekend showervaganza. What happens when she uses up 99% of the water and the iron shiek is left high and dry with shampoo in his eye?? How much extra weight will shower heads (and possibly extra tanks) add in addition to the tonne of water? 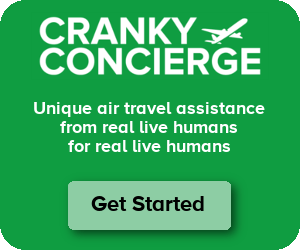 It sounds like what they’re really doing is cutting costs from one service in order to use toward another (this plays into JetSetter’s notion that all they’re doing is taking away from coach so that they can add to first class, which isn’t a horrible thing but probably isn’t going to save much money). YES! YES! For the first time this year CF empathizes with the plight of coach class over first class. Halelujah! Welcome, CF. I read the link and it seems like this shower is for the A380 only, a mammoth plane as it is. How many seats does Emirates plan for first class? (Or whatever they’re going to call this class on the A380.) Even with an 8-12 pax seating … I dunno, that’ll be a bit of a queue. Albert – there are 14 F suites up in the nose on top. Not sure how many different showers there will be. I would assume on Emirates that F passengers are paying for themselves and a lot more, but I don’t have any numbers. I have no problem with focusing on F passengers, but I don’t see having a shower facility on the ground as being such a disadvantage that they need to carry around a tonne of water in the sky just to avoid it. I’ve heard from a source, that they will be using dehydrated water to save weight and space. And, that the FA’s will assist you while you are showering. Agreed on that note. Shower in the airplane just seems rather impractical, if not outright excessive. And then we are supposed to get mad when EU attempts to put carbon tax on flights? On another note, government aid to Alitalia was judged illegal today by the European Commission. I suppose that the weight of the water is justified because it is for people who can afford first class. Removing the papers actually is a good idea as it is not really needed but the balance between the two is really funny. Bidets I can see. I think that’s a great idea. But showers? Yeesh, the things must be tiny. Probably like showering in a phone booth.